「제천 옥순봉(堤川 玉荀峰)」은 비가 갠 후 희고 푸른 여러 개의 봉우리가 죽순이 돋아나듯 우뚝우뚝 솟아있다 하여 이름 붙여졌다고 전하는데 이름에서 알 수 있듯이 남한강 위로 솟아오른 봉우리가 매우 특이하고 아름답다. 옥순봉은 본래 제천(당시 청풍) 땅인데 이곳이 단양팔경에 속하게 된 것은 조선 명종 때 단양군수였던 이황이 옥순봉을 단양에 속하게 해 달라고 청풍부사에게 청하였으나 허락하지 않자 옥순봉 석벽에 ‘단구동문(丹丘洞門)’이라 새기면서 이곳을 단양의 관문으로 정했다는 설화가 전해지는 데서 비롯되었다고 하며, 인근의 구담봉과 함께 여러 시인묵객들의 시문이 다수 전하는 절경지이다. 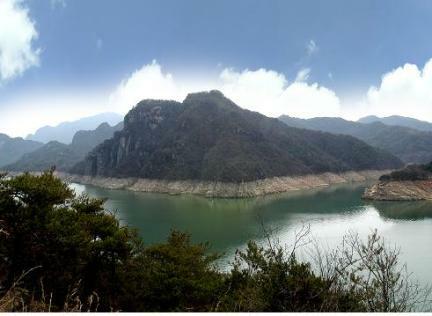 Oksunbong Peaks was named as such because it looks like fresh bamboo shoots sprouting after the rain. 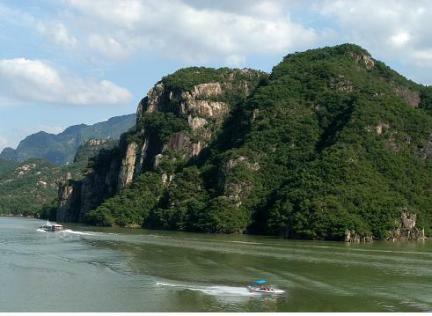 As its name suggests, the peak consists of jade-like white rocks rising from Namhangang River. Though located in Jecheon-gun (Cheongpung-gun during the Joseon Dynasty), the peak came to be known as one of the “Eight Scenic Spots of Danyang.” According to a local anecdote, famous Neo-Confucian scholar Yi Hwang (1501-1570), while serving as magistrate of Danyang, asked the county magistrate of Cheongpung to concede the peak to his administrative district. When his request was rejected, Yi had the four-character phrase Dan-Gu-Dong-Mun -- meaning "Gate to Danyang" -- carved on a rock wall. Complimentary poems by various writers are carved on the peak as well as on nearby Gudambong Peak.